This contemporary video bar hosts drag shows, karaoke, and 18+ college nights. I HAVE FOUND PLAN B TO BE VERY RESPECTFUL OF ALL THE LGBT COMMUNITY. 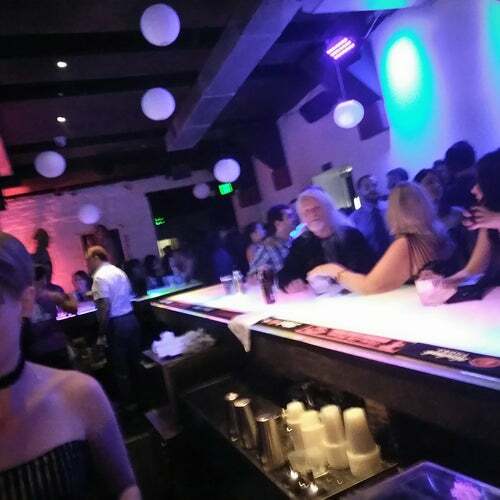 FROM MY " HAPPY " POINT OF VEIW TO BE AN EVEN MIX IF NOT MORE LESBIANS THAN GAY MEN...LOVE THE BARTENDERS, ALWAYS SMILING AND WELCOMING. GREAT DANCE FLOOR, LOTS OF GIRLS TO MEET UP WITH...HEY , I LOVE THE PLACE. Nice club. It was karaoke night. Which I find ironic for an "alternative" bar called "Plan B". I will say that when they first opened it was nice décor and seemed to have a lot of hope, and I really enjoyed the environment. They have a ladies night, and I know a lot of straight friends who will go there to dance, and I really looked forward to a place where queer people could go and feel safe. Unfortunately I noticed that as a woman, I have felt less welcome and less safe at Plan B than I have ever felt even at some of the most ridiculous regular "college" bars, and that is sad. I've noticed several things over the years -- often the bartenders are rude or will ignore women at the bar and it will take up to 10x as long to get a drink; women will not get treated with equal respect. Some nights, like fruit fest, a lot of my friends will be in town, and I know the atmosphere can be fun. I recommend going just about anywhere else. Even Woof's is more welcoming to women than this place is, and that's depressing because Woof's makes no pretenses about being "open". Plan B is amazing. Such a fun place, and they keep the alcohol away from underages very well. There are separate wristbands for 21+ and 20-. They also make sure its a safe fun environment. The dance floor is always pumpin' cuz the DJ knows how to get things heated up! Bartenders serve up d-lish drinks that make you want to shake your tush!